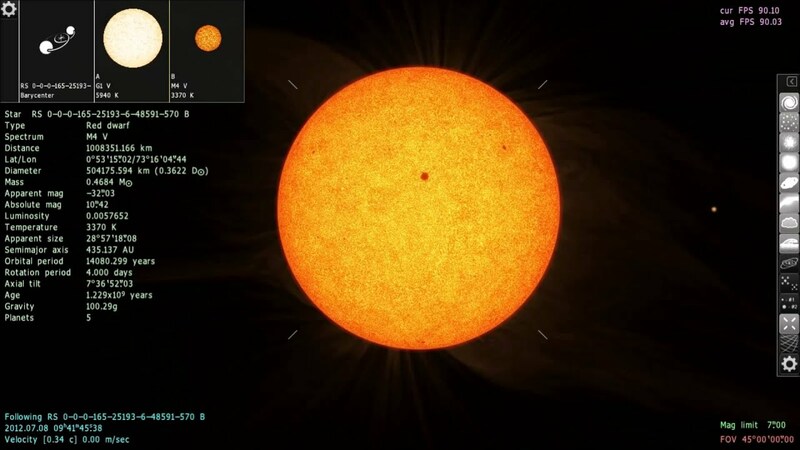 Forum » SpaceEngine » Troubleshooting and Solutions » How to improve the resolution of stars? How to improve the resolution of stars? which the configuration so that my stars appear like these this screenshot. Press "V" on your keyboard to change the exposure between auto and manual. That will make the stars look like your first two images. You can also do some experimenting with the settings in the exposure/magnitude popup-menu at the bottom-right in the GUI. Hover over the buttons with your cursor to see what they do. The stars in those screenshots are being viewed at a greater distance than the one in your screenshot. For all stars, they should be at full brightness until you get close to them. Then the "sprite" view dissipates and you will see the actual shape and detail of the star's body, as you can see in your screenshot. You should be able to back away from that star and then see its full brightness emerge. If you don't see it change, then it might be a setting that is turned off, though I can't recall off the top of my head what setting that might be. Hope this helps. I discovered that my HDR is selected but disabled the option to change it and found no way to enable it. Could this be? z_zone, I don't understand what you are talking about. Do you talk about light rays visible around stars? This is called lens flare and showed automatically then you are far from the star (much farther than on your 3rd screenshot in your first post). Also, check in the graphics settings, if the lens flares are enabled. Problem solved, it was the Nvidia drivers, I went back to older drivers. Thank you all and sorry if I expressed myself badly in time to report my problem.